THE RAPIDLY DEVELOPING LNG BUSINESS IS FACING NEW TECHNOLOGY challenges worldwide. Increasing attention is being paid to floating liquefaction plants (FLNG) and floating storage and regasification units (FSRU). These large vessels combine a liquefaction or regasification facility with a large storage tank and have the advantage of providing higher flexibility. They also cost less than a conventional LNG supply chain. For any FLNG or FSRU project to succeed, it is essential to Incorporate the experience gained in more conventional LNG projects. With its long track record in serving the LNG industry, Yokogawa is ideally positioned and is able to provide a total, seamless automation system solution controlling every phase of an FLNG or FSRU facility's operations. Yokogawa's expertise in providing process automation system solutions to a wide range of industries has developed alongside its involvement in major international LNG projects, which dates back to the 19605. The company Is well positioned to provide the LNG sector with optimal technology solutions. In each LNG project, Yokogawa has delivered solutions that both reduce risk and bring clear benefits to the customer. Yokogawa has experience In undertaking a wide range of challenging LNG liquefaction projects, completing retrofits of systems and instruments without interruption to plant systems and instruments without interruption to plant production schedules. 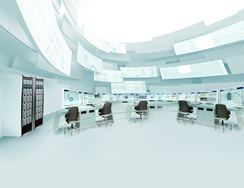 Working with powerful Yokogawa system solutions that offer both expandability and full compatibility with older systems, Yokogawa's experienced engineers are able to execute hot cutovers of control systems as well as utility and loading plants. For the customer, this means improved productivity and greater consistency in the installation of hardware and software throughout a plant. Distributed control systems (DCS), also known within the LNG industry as integrated automation systems (IAS), are playing an increasingly important role in LNG carriers. A DCS oversees all of a ship's major systems and functions including boiler all of a ship's major systems and functions including boiler control, burner management, power management, steam distribution, cargo compression, and cargo discharge. The CENTUM CS3000 provides a highly reliable and secure control solution that LNG carriers can depend on, and Yokogawa's track record in successfully integrating key shipboard processes in a DCS is second to none, With a Yokogawa solution in place, an entire LNG carrier can be safely and efficiently controlled from a single operator console. In the early 1970s Yokogawa developed computerised control systems with a full complement of automation algorithms and functions and began introducing these for use in LNG regasification plants. Since then Yokogawa has successfully completed a large number of these projects worldwide and presently enjoys a 58 per cent share of the global regasification market. With their accumulated know-how in this industry, Yokogawa engineers are able from the front- end engineering phase to propose an optimum Integrated solution that reduces the customers total cost of ownership. Based on these accumulated experiences, Yokogawa will continue to play a leading role in the LNG industry.